The other day, we looked at the hummingbird’s finished head on the Secret Garden embroidery project. 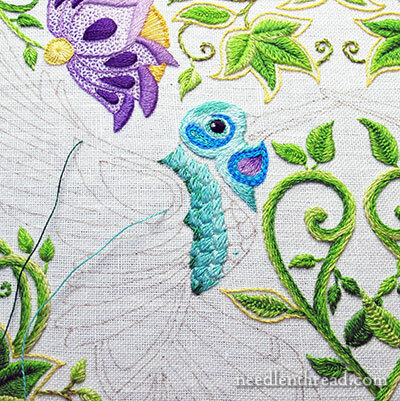 Today, I’ll show you how I’m embroidering the scallops on the bird’s chest. I’m still feeling my way along here, so eventually, I’m sure we’ll run into a few areas that need to be un-embroidered (as in, ripped out!) and re-thought, but for right now, I’m pretty happy with how the little bird body is turning out. In this lower part of the main body of the bird, I’m using very simple satin stitch (no padding) and straight stitch, and echoing the colors in the background on the head. The unfinished scallops you see there will be a different color scheme altogether. I started on the scallops closest to the wing and stitched them in a dark emerald green. Then, reverting to the same colors used in the long and short stitch on the head, I worked from darker to lighter, layering the scallops towards the neck and the front of the bird’s breast. Then, on each layer of scallops, I took the darker shade from the layer before and stitched in a few straight stitches to give some depth and contrast. Right now, you can see that the edges of the scallops are not super-perfect – they really don’t need to be. Sometimes you can see a thread of fabric here and there, and some of the edges are a little jagged. Here, we’re looking at it very close up, anyway. The imperfections are quite alright – the edges will be covered. My plan is to accentuate the scalloped pattern using a darker thread around the scallops, probably in a kind of modified fly stitch. I’m thinking of using the emerald green, although I’m not a hundred percent certain. Too much contrast there may result in a bird breast that looks as if its covered in armor or scales. I’ll try it anyway. If it doesn’t work, I can always pick it out, right? At this point, I’m thinking the front portion of the breast will be shades of purple, and the neck band (where I’m thinking about adding a little texture) will be the vivid blues. Once this portion of the bird is complete, I’ll give a color list so far. I’m hesitant to give an absolute color list on something I’m still feeling my way through, because I wouldn’t want you to waste money on colors that may not be used after all. Any questions? Comments? Suggestions? Have your say below! just popping in to say how I absolutely love this! Blue is my fav color and the bird is coming out gorgeous. If I ever make the Secret Garden project I will definitely do it like this. I just wanted to thank you for your blog it has helped me through some rough times, giving me something to look forward to that interested me, distracting my mind from what was going on around me Thank you so much. God Bless! He is looking wonderful! I just came across a delightful peacock on Pinterest http://www.pinterest.com/pin/575194183631758241/ The coloring and stitching is quite beautiful with the use of the bright blues and the blending into neutrals. It will be fun to see your finished result. Love how the hummingbirds are turning out. 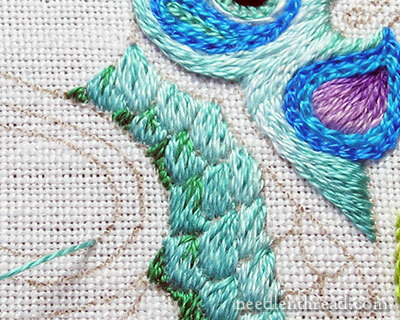 Maybe consider a pale Kreinik metallic for the fly stitches on the hummingbirds…something that would not add a lot of color, but add a bit of that shimmer that hummingbirds have in their feathers. A really light blue or green might be nice, maybe even white would work. Sorry, no suggestions. I love watching how you work your way through a piece of work. Seeing it come to life and the colors you choose as you go along are always lovely in the end, in my opinion. The hummingbird looks great so far! Love the emerald green touches! Hi Mary, the hummingbird looks beautiful and I love the colours. Can’t wait until I am stitching them….. Slowly getting there. Thank you for your inspiring stitching. What type of thread are you using? Is it floss or pearl cotton? One strand (out of the six) of regular DMC cotton floss. Thank you for your quick response. Your stitching is truly a work of art and you are truly inspiring. Not sure i want to tackle such a complicated project but am ready to start on something a little simpler. I don’t know what but I think a beautifull paon,green emerald…dark blue. I love your choise for the stitch.The selected points are well worth drawing.And me too, I thought the eye was a pearl, breathtaking!. So glad you changed the head. It now looks perfect. The scallops maybe a medium emerald, but not to dark. A lot of bird feathers are edged in white. I think that the breast should be very pale lavender and the neck band will probably work in the bright blue. I love the way you describe things and your “road trip” sounds exactly the way my late husband planned things. Really made me laugh. One thing for sure, we packed a lot in a few days and came home to catch our breath. I really like the scallops and the light blue and the green thread is really pretty and compliment each other. I can’t wait to see the modified fly stitch that will be interesting. The whole project is coming along nicely and I will be interested to see how you approach the wings what colours and stitch you will use, I always learn something from your projects which I can use on my embroidery projects. Thanks for sharing your progress on this project with us and I really look forward to more exciting up and coming posts on it. I hope you have a needling weekend. Oh, this is going to be gorgeous! Do you think that the bird’s “collar” needs to be something that really contrasts? Perhaps a golden yellow, or even a red… I suppose it depends on whether you want your hummers to really stand out from the background or not. But I think anything will be lovely! Beautiful colors and beautiful stitching! Thank you for sharing all, or most, of your needlework projects with us. You’re the star of my inbox. First: I adore the touches of Emerald! They’re rich without detracting. I hope you continue to add small touches of it in the feathers, it’s divine! Second: I also agree that adding a bit of purple to the breast is a fine idea, but I do hope it’s not the same shades as the flowers. To be honest, the patch on the throat is still bothering me. I think it’s because the blue around it is so vivid and it seems washed out. So, if you do add purple to the breast I’m hoping that like the Emerald it’s a rich royal purple. Third, whatever YOU decide will be the “right” choice so please don’t keep us waiting too long. So very pretty! Would love to see a picture of the whole project to get an idea of how this looks with the flowers and leaves. If the emerald green outline of the scallops looks too harsh, how about on each color using the next darkest color for the outline. I’m enjoying how you are working through your decisions! Do you have any general satin stitch tips? Mine always come out really goofy looking…I don’t really know how to describe it. Thanks! I’m really loving your colour choices! I hope you plan to share pictures of your project with the author of the book – I’m sure she would be thrilled to see it. It’s looking lovely. I like the idea of the straight stitch highlights. I might use that technique for a project Im working on. Sinceridade estou amando seus bordados não tenho nem palavras para dizer de tanta perfeição.Amo bordado livre e estou aprendendo com você tendo mais gosto ainda para bordar. Parabéns que Deus continue abençoando este dom que lhe deu. Beijos. Could you please advice on the type of needle and size number to work on this project, with 2 strands of DMA cotton (and 1 strand for the long and short stitches. My fabric is a thick and weaven tight cotton. Many thanks. You could probably use a #8 crewel needle for the two strands, and a #9 or #10 for the single strand. On a heavy, tightly woven cotton, a slightly larger needle might take the thread through more easily, but if you find the 8 too big for the two strands, try the 9. Mary, I had to tell you that I have “picked out” the large bottom leaf at least 4 times! I can’t get the long and short stitching to look nice. I am a beginner, and I just have not figured out how to master it! Your work is just beautiful and such and inspiration to me! Can’t wait to see your color list! HOLA: MARY DESDE CHILE TE ESCRIBO PARA FELICITARLA POR SUS PROYECTOS. HACE POCO ME COMPRE EL LIBRO DEL JARDIN SECRETO PARA SEGUIR SU BORDADO POR FAVOR NO LO ABANDONE. ME DESPIDO ATTE. I’ve been going through your older projects for inspiration, and the breast of your crewel rooster has my creative juices flowing to the point I think I will use the buttonhole stitch on my hummingbird breasts. My adult son (who never comments on any of my artsy craftsy stuff) asked me the other day if I planned to enter the work in our local agricultural fair! That really surprised me, it was a compliment from a completely unexpected source! He always will respond nicely if I ask him if he thinks it looks fine, but he has never volunteered anything like that before. Who knew he paid any attention? I smiled all day after he asked me that! That’s great, Tracy! I love it when things like that happen! Incidentally, originally, I thought about using the same approach on the birds. Don’t know why I didn’t – it’s a nice way to work scallops! Previous Previous post: Embroidered Sacking & a Really Cute Chicken! Next Next post: Sardinian Knotted Embroidery – Two Winners!